From the website of the Traditional Latin Mass Community of St. Mary Mary Magdalen: See Please click here for original article. Please offer up prayers for the repose of the soul of long time Traditional Latin Mass supporter, Victoria Peters. She died on Saturday evening 2/11/2017. 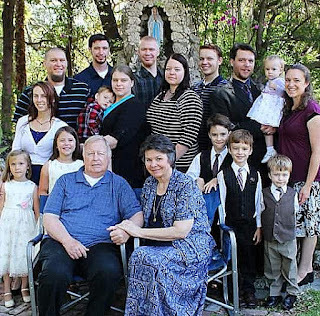 Vicki and Rick have seven children, three married & nine grandchildren. All five of her sons were Altar Servers at Los Angeles area Latin Masses with Fr. Robert Bishop, CMF covering a span of over 25 years. Vicki was active with Una Voce Los Angeles and served as Vice President. The extended family lives in Colorado Springs and they will appreciate your prayers on her behalf! Funeral details to follow. New Mass Times: St. Anthony Catholic Church, El Segundo. Thank you for the news. She will be remembered in prayer. A good and fervent soul she was. Requiem Aeternam dona eae. She was feminine. He, She, It= Is, Ea, Id. Dative case: eae.